I woke up to a cold morning in the quaint village of Ghangaria. I walked upstairs with sleepy eyes to do a quick weather check. I hoped for a better weather, especially wished that it didn’t rain. 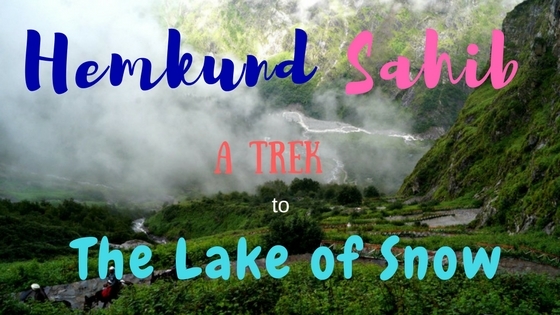 Because I had braved the rain and trekked to Hemkund Sahib the previous day, and let me tell you, it’s exhausting to trek in a heavy downpour. Add to that heavy winds, rapid gain in the altitude and steep uphill climb with cobbled steps – rain only makes a trek a LOT harder. So I hoped that my trek to Valley of Flowers would be rain-free. The rain Gods seemed to have heard my prayers. Because after a while, the weather turned better. I couldn’t be any happier. With my camera, raincoat, trek pole and a water bottle I walked through the only road of the little Ghangaria village for a few minutes to be out to the starting point of the Valley of Flowers. You find a direction board, and a narrow cobbled path first led me to the check post. I registered my details, got the permit and began my trek. The sun shone, and the lush greenery looked like they were soaking in the sunshine as well, after embracing heavy rains. Any trek in the Himalayas is a delight to the senses – only the degree of delight varies, but it’s always a treat to the eyes and ears. It was the same here. I passed through waterfalls – big and small, streams that meandered through the valleys creating a path of its own. These streams looked milky white coming from the top of the mountains, making it impossible for anyone to guess their origin. I met Nishesh, a lad who had met in Rishikesh a few days ago, and a few people who had just started the trek as well. 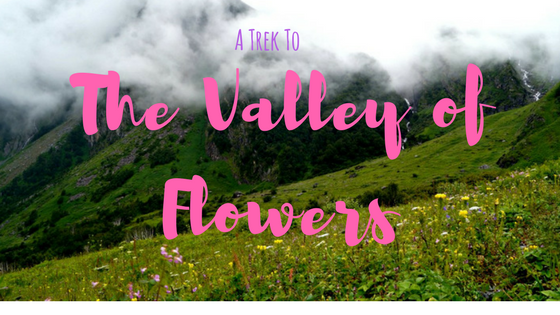 The valley of flowers, located in Chamoli, Uttarakhand is one of the best-preserved beauties of nature, which stretches for 8 km. The revered Nanda Devi mountain peaks flank the valleys. The legend is that the Gods showered flowers from heaven on the birth of the Sikh Guru Gobind Singh, who is believed to have later come to Hemkund Sahib, which is close to this park. It is said that some of the rarest species of flowers can be seen here, a few of which are not found anywhere else in the world. Also, rare plants with high medicinal characteristics are also present in this valley. The Valley of Flowers became a protected park in 1992. 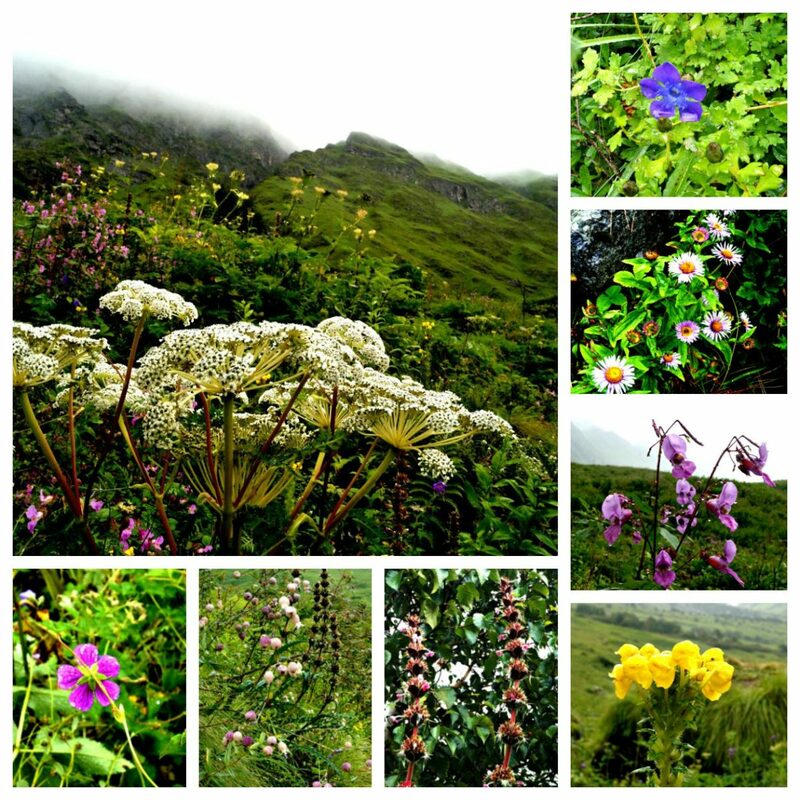 One of the best parts of the trek to Valley of Flowers is the nature of the trails. The trail keeps changing at many places, the trek overall is not arduous physically, but the duration can exhaust you if you are not accustomed to long hours of hiking. It’s an uphill climb for some time on a narrow trail once you begin the trek. As you progress, the uphill rocky path opens up for valleys, and with each passing valley, the beauty of the landscape magnifies. 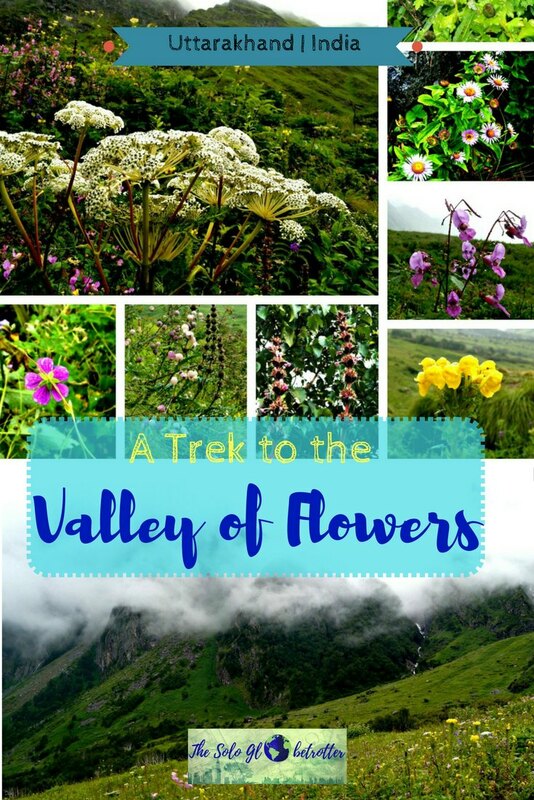 “Walk until you see the maximum type of flowers in different colours in the valley” the officer at the check post had told me when I asked him how would I find the trail and the summit of the trek. I noticed that the variety of flowers increased ahead and the lots of small and big streams waded their way, adding a soothing musical sound to the beauty that unfolded at every turn in the mountain. One another thing that changed dramatically along with the scenery was the weather. The sun suddenly got blanketed with dark clouds, taking away a bit of warmth and replacing it with cold winds. It looked like the sun gave in too quickly, as it started raining in no time. No, not again! I sighed. 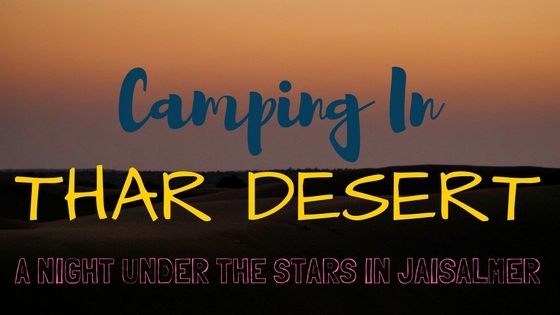 I was just a few minutes away from the most scenic landscapes, and the golden time was so near – a golden time for the photographer in me to capture them, a time for a trekker in me to reminiscence the moments, a time for a traveler in me to absorb the views. And the rain had decided to ruin them all! I looked up and prayed to wait while trying to quickly snuggle my camera in my bag and wore my poncho. The big raindrops kissing my face turned into a drizzle in a few minutes and I had made it to the centre of the valley of flowers. I still dared to click some pictures protecting my lens with my hands and took a few from my mobile as well! I knew the moment I arrived at the centre of the valley of flowers because the view was simply stunning and the landscape looked ten fold vibrant than the ones that I had just passed. Till the farthest at the horizon, the valley spread itself, and streams were flowing below. I was surrounded by densely stuffed mountains on all sides, with gorges emerging at random places. Flowers of all kinds and colors – red, purple, black (yes, black), white, different shades of yellow, pink, red and so many more spread around me, and for some time I felt it too overwhelming to take in the colors! The scent of these thousands of flowers ringed in the air, and every blowing wind mixed the sweet scent. I spent more than an hour walking amidst these flowers, looking at many of them that I was seeing for the first time. I felt like a child attending an interesting, vibrant class of nature. Yes, the rain hadn’t stopped at all. The drizzling water sprinkled the valley of flowers enriching their colours. I felt very happy being here, as I had finally made it after postponing this trek to Valley of Flowers a few times. I felt happy for making this trek on my own because I had overcome my doubts that I had when I had cancelled this trek with a trek group. Everything happens for a reason after all, because I wouldn’t have experienced this gorgeous valley of flowers the same way had I gone with the travel company. I agree it would have been different, but I’m sure that nothing could beat this experience of mine. It’s sometimes better to ditch the known and forgo plans because you never know what adventure lies ahead! Do you agree? Have you had any such experiences – the good ones or the bad? Tell me your stories in the comments below, I would love to read.